In an effort to get back into blogging regularly I will be posting some Etsy treasuries I made with a ton of great Rockabilly finds. 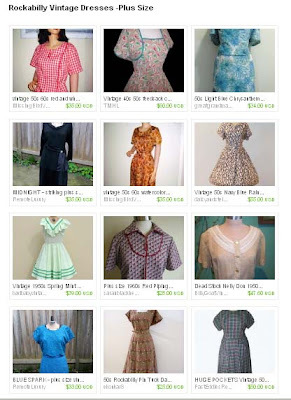 This first treasury is large-xxl dresses for the curvy rockabilly girls. None of the dresses is over $60 and most are in the $30 range. I couldn't fit all of the dresses on one page for a screen catch, so there are 4 more that aren't pictured here. Thanks to the blog A Few Threads Loose, I can repost the link to this beautiful vintage pattern that is available free on the German site Neu4bar. I would suggest this for an intermediate to advanced sewer because some of the writing is in German, but can be figured out if you are familiar with garment construction. I converted the pattern measurements from cm to inches and they are: b-40" w-32" h-42.5". Don't forget my posts on resizing patterns to grade up or down!